Twinkling Paper Studio: It's Tulip Time! Last month during the Anniversary Release week over at Papertrey Ink, I fell in love with the Tulip Time Stamp & Die Set and I knew I would order them as soon as I was able. While I love the look of Layered Stamp Sets, I am not always very good at lining up the images. That is still true, but when I do get them lined up, it is enchanting! I think this is a technique that requires practice and I did get a lot of practice this weekend. If you don't get good ink coverage on your stamp the first time, its virtually impossible to re-ink your stamp and get it lined back up in the identical place, even with photopolymer stamps. Ninety nine times out of 100, it'll be a miss and into the trash can it goes. I do try to save them them but the odds definitely aren't in my favor. I will say that I'm a lot better at stamping than I used to be. Practice does indeed make perfect or close to it. Part of the beauty of stamping is that you can mix and match different sets to accomplish an infinite number of designs in your cards. Betsy Veldman created the Tulip Time Set. The leaves have two layers and the flowers have three layers. It makes for some incredibly beautiful designs. I finally broke down recently and got myself a MISTI. MISTI is short for Most Incredible Stamping Tool Invented. This product was invented by a stamper, for stampers and was initially made at home. This is such a phenomenal tool that they are now manufactured with laser etched doors and have a Patent Pending for the design. While this layering set did take some practice, it was by far the easiest time I've ever had doing it. I actually only had one image that got messed up and I was able to tuck that flower behind the others so no one can see the boo-boo. Since you can do as many as five tulips at a time, I also had time to play with several color combinations. I cut the Tulip Time Die from Stamper's Select #110 White Card Stock and then used the negative to line up my stamps and also as my placeholders for the die cuts. It was pretty easy and I could do several in one sitting. I used all Papertrey Ink Perfect Match Dye Ink Cubes. These cubes are a great value at $2.00 each and it allowed me to try several colors. I got 19 of them during the anniversary sale making them another 9% off. I stuck with colors I normally use and didn't feel the need to get colors I don't use much since I am just trying them out. I think there are a lot of pluses to this smaller size like how much storage space they require. Since I normally take ink pad to the stamp rather than stamp to the ink pad, I think I could potentially have all small ink pads. Papertrey also has re-inkers available although I didn't order any at this time. I also already had a little Tim Holtz Container from several years ago that holds all 19 of them and has room for about 11 more. It's like a mini lunchbox with a window in it so I know what's inside. I happen to have two such containers which is really handy since I'm planning to try a few more inks in this size. For this card I used Sweet Blush, Lovely Lady and Scarlet Jewel Papertrey Inks. The sunshine came from the WPLUS9 Sunshine Layers Designer Die Set. I cut it from a scrap of Canson XL Watercolor Card Stock and used a Mini Ink Blending Tool with Harvest Gold Ink to color it. The greeting also came from the Tulip Time Stamp Set. I stamped it with Versafine in Onyx Black and heat set it with Simon Says Stamp Clear Embossing Powder. I wanted the bold black against the pink oval but I really dislike the use of Black Embossing Powder because it gets everywhere. This way is soooo much neater. I die cut a slightly smaller oval from fun foam to put behind the pink oval and mounted that onto an Papertrey Ink Stamper's Select White A2 Top Folding Card Base. For the tulips, I used a combination of Ranger Multi Medium Matte, Thin Foam Squares and Regular Foam Squares sometimes doubled in thickness. I tied a bow with some off white ribbon and attached it to the flowers with a glue dot. Since I had so many sets of tulips already stamped, this card came together super fast and easy. 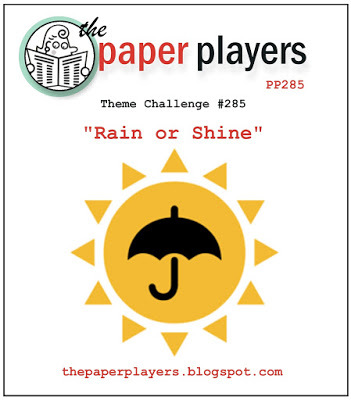 I'm joining in over at The Paper Players Challenge #285 this week with the theme of "Rain or Shine". It's really easy to pick "Shine" at this time of year. Here's hoping you all have a Sunshine-y day! What a pretty bouquet with that white ribbon! and I like your oval sunny background, too. So pretty, love the little sun. A perfect touch. Vicki your bouquet of tulips is just stunning! What a gorgeous springtime creation. 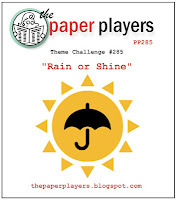 Thanks for playing along with my challenge this week at The Paper Players! Wow this is gorgeous! Such beautiful flowers! Glad you joined us at the Paper Players! Just gorgeous! Those tulip images are sensational, I've been seeing them a lot on the web and yours are just beautiful! A happy, sunshiney creation for sure! Thanks for sharing this with the Players this week!